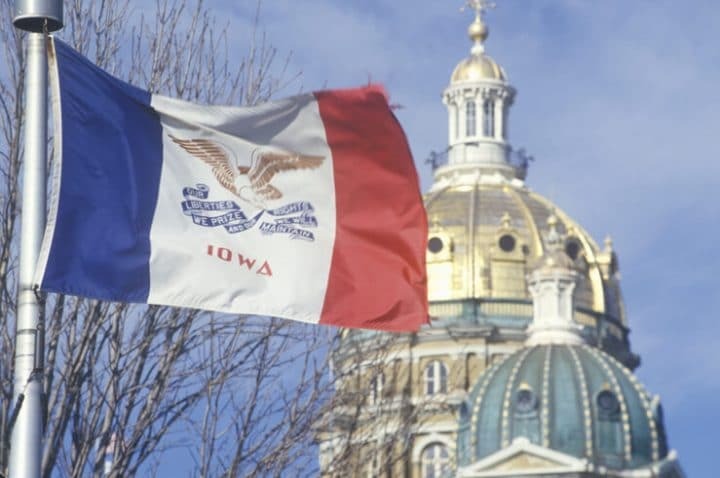 Iowa’s sports betting debate in 2019 is reaching its later stages, as lawmakers are working on amending legislation ahead of an early May legislative deadline. In most states, sports betting isn’t nearly as partisan as other issues facing state legislatures and budgets. That’s not the case in Iowa, where Republicans and Democrats are split over some of the provisions of the bill. Democrats are far less interested in gambling on Iowa college teams than their colleagues across the aisle. So, a compromise was reached to prohibit in-game bets on contests involving Iowa colleges and universities. Additionally, the bill was recently amended to require in-person mobile sports betting account registration until 2021. The compromises, which include other relatively minor changes, were hashed out prior to last week’s committee hearing on House File 648. The legislation, sponsored by a Republican, could be voted on by the full House as early as the first week of April. However, the debate on what the final version will look like is far from over. Iowa state Rep. Mary Wolfe, D-Clinton, said in an op-ed published over the weekend by the Clinton Herald that she supported HF 648 in the Ways and Means Committee last week, but her support could change to opposition ahead of a House vote if major changes aren’t made. Wolfe is calling for a significant increase to the taxes associated with sports betting. $3 mm. Iowa is considering the same rate that is applied to sports betting revenues in Nevada. Wolfe doesn’t think that is nearly enough, citing concerns that mobile sports betting will keep people at home. The result, according to Wolfe, could be less money for the Rebuild Iowa Infrastructure Fund. So, Wolfe has pitched a 3% tax on the mobile sports betting handle, paid by the consumer. She’s calling it a “mobile convenience fee,” and if enacted, it would be the first of its kind among the states with legal sports betting. Under the lawmaker’s plan, Iowa bettors would effectively pay a sales tax on mobile sports bets. Sports betting is just one gambling game offered by casinos, but Wolfe’s pitch hinges on the assumption that mobile wagering will keep a significant number of people at home who would otherwise visit the casino. On the contrary, sports betting can bring new customers to the casinos and the properties are still very much incentivized to capture as much non-gaming revenue as possible. Wolfe’s concerns are premature, especially considering that a regulated Iowa market will have to compete right away with the existing (and mature) illicit market. Banning in-game bets on Iowa college teams is a win for the offshore gambling platforms and local underground bookies, so a MCF would further put an Iowa regulated market at a disadvantage. Wolfe admitted this. It’s safe to assume some Iowans actually will, especially if they are frequent bettors. The current difference in monthly revenue between the New Jersey and Pennsylvania sports betting markets has demonstrated that a state should probably not even bother with sports betting legalization if statewide mobile betting isn’t part of the market. Also significant is remote registration for an internet sports betting account. Iowa delaying remote registration for 18 months isn’t the best plan, but it’s workable. Banning in-game bets (which are increasingly becoming a staple of state-of-the-art sports betting) on Iowa college players is short-sighted, but more than likely not a devastating blow to the Iowa market. The law could be changed down the road, as Iowa gaming regulators demonstrate the ability to effectively regulate the activity. However, a 3% handle tax paid by the bettor could be the straw that breaks the camel’s back here. The Iowa Legislature can’t give too many structural advantages to the unregulated market if it wants to have a successful sports wagering industry. If Wolfe’s proposal gains traction and becomes a sticking point in the debate, it might be better for the Hawkeye State to not legalize sports betting in 2019, and instead continue the discussion into 2020 in an effort to more fully vet some of the problematic provisions of the legislation.